Michael Ciannilli, manager of NASA's Apollo, Challenger, Columbia Lessons Learned Program, at the Columbia Preservation Office on the 16th floor of the Vehicle Assembly Building at Kennedy Space Center in Florida. Fifteen years after the space shuttle Columbia and its crew of seven were lost returning home from a 16-day mission, pieces of the winged orbiter are still being found and the debris is now being used by NASA to educate and inspire a new generation of space workers. To learn what happened, NASA joined with other federal agencies, as well as state, county and local authorities, for what became the largest ground search in United States history. After recovering the remains of the astronauts, attention turned to the melted and mangled fragments of the orbiter that were strewn over miles of forest- and swamp-covered land. But in the last couple of years, the program has grown to fulfill another mission — to teach and inspire. Debris from the fallen space shuttle Columbia as seen in May 2003 during a reconstruction effort as part of the accident investigation. 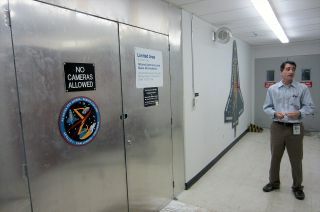 The debris was later moved into the Columbia Preservation and Research Office in the Vehicle Assembly Building at the Kennedy Space Center in Florida. Though the Columbia Research and Preservation Office is no longer an independent entity within NASA, having been folded into the ACCLLP, it is still being called upon to serve its original purpose. "We have actually got the largest loan in the history of the program that is out right now," Ciannilli told collectSPACE.com. "It's still in progress at the University of Texas El Paso, and one of our former astronauts still is involved with that. He's one of the key researchers in it and it's actually over half a ton of material, so it's our largest loan." NASA Kennedy Space Center Director Bob Cabana, center, leads a panel discussion during an Apollo, Challenger, Columbia Lessons Learned Program (ACCLLP) employee event.